If you like to keeps your tools organised while in storage then our custom made tool boxes are perfect fit for you. Being light in weight and strong enough to hold relatively heavy tools, our tool boxes are made of Corrugated + Cardboard materials. You can choose to print your brand or other information on. Manufactured with recycled material and processed in highly equipped facility, our personalised tool boxes have a turnaround period of 5-6 days. Use our fast ordering system to fill out your box details and our sales staff will contact you with a price. We recently ordered 250 special opening custom corrugated cardboard boxes with spot UV and embossing. The lamination and quality of printing was absolutely amazing, it made our product packaging look gorgeous. 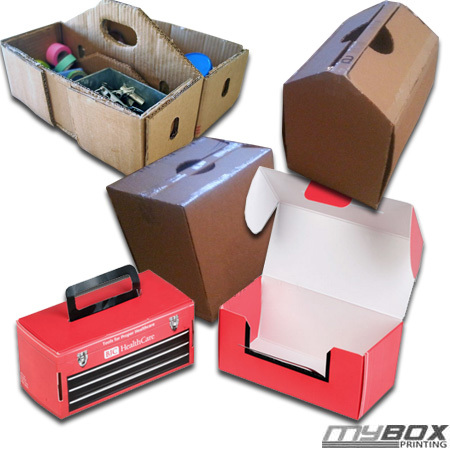 Thanks guys for providing us with custom tools box and hardware packaging boxes in best price and fast free shipment.